I've been trying to pace myself about working on our guest half bath for Linda's Calling It Home: One Room Challenge. ...I speed up, then slow it back down to fall in line with everyone else. This room is a little on the small side and will not take very long to finish, so I'm pacing myself on the project....to give the hubster time to digest all of the changes I want done immediately over the next few weeks in the house. Thankfully, he's finally jumped on board with this project. He sent me this link from BHG today. And, um, no you don't...do not be patting him on the back for this. He is still making references to my egg debacle in the kitchen. I had mentioned that one of the changes I wanted to make in this bathroom was a better, nicer, larger, anything other than what was there, mirror. You will be happy to know that I found one on Craigslist and made a trip almost an hour away to check it out. I bought it! It was worth the drive and was so reasonably priced I would have probably made the purchase and used it somewhere else in the house if I had not needed it for this room. To give you an idea of the size of this bathroom, or the size of the mirror, the mirror will almost touch the two side walls. The hubster held it up for me so that I could see how it was going to look in the space. It makes a very bold statement because of it's size, but I think it will be great. It needs cleaning and definitely a new paint job. Just what I needed....another paint color decision....I'm already 0 for 2 in this department! I'm open to any and all suggestions for paint color on this mirror! The next part of this challenge is finding a vanity! I really want a vintage piece of furniture so that the hubster can show off his expert jigsaw skills, but the dimensions are bizarre and we may end up with a traditional vanity. Love, love, love it and when it comes to mirrors, bigger is always better! Paint? I'm boring, I say go with white. Can't wait to see what you come up with! Hi, Benita ~ That mirror is beautiful! I can't wait to see the changes you make to it. I definitely have to start spending a little more time on Craigslist. So many great finds! Good luck with your ORC. 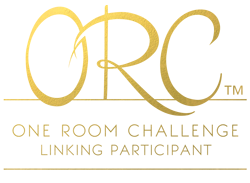 I'm looking forward to seeing the finished room! Tiffany, thank you so much and thank you for visiting my blog today! Craigslist does have so many wonderful things...sometimes it is a wait and see kind of thing, but there is usually always something cool to find! Thank you again so much! The mirror is definitely a bold statement. I love that it has some decorative detail at the top but other than that is pretty plain. Thank you so much! Oh, I can't wait to see what you will be doing in the spring! Everyone has so many wonderful ideas for these projects!! Great find on the mirror Benita-love the shape. OK, I will not say anything sweet, about the man. He has to stop with the egg-jibes, before I will be on his side again. But, have I mentioned, that I keep my broom right in my kitchen. Not hidden away somewhere? Always at-the-ready as it were??? Hmmmmm? Have I mentioned that????? Thank you so much Tessa...I thought it was worth a trip! :-) LOL...you are so funny and thank you for being on my side! :-) I like that idea...a broom in the kitchen, right out in the open...for keeping them in line...I like the way you think!! And appreciate your ideas!! :-) Much love and hugs!! Now that is a good find ... well done. Have a happy weekend, it will soon be here. Thank you so much Jan! He's finally backing off a bit, because I have a great tale to reveal on him...I will be sharing it on the blog later this week! ;-) Hope you had a great weekend!! I am with Kim on this one. The bigger the better for the mirror and I think white or even solid black would be awesome on this mirror. I know whatever you chose it will look fabulous. Thank you so much Kris...I do like the size...now just to find a perfect vanity to go with it! That task is a little more challenging than I originally thought it would be. Hope you had a fabulous weekend! Hugs!! Christine, thank you so much! It was purely luck that I ran across this mirror. I'm not good at making paint color choices either, that's why I've hit a snag with this room. I've got to decide on wall color and I think that will help me decide on a color for the mirror...decisions, decisions...LOL Hope you had a great weekend! Hugs!! That mirror is fabulous!!! I would have to see the big picture of the room to pick a color....I am with Prairie Kari....what she said!! Great mirror find, and I agree with Prairie Kari also. Wait until you have both the mirror and vanity to decide the color. I'm looking for a mirror to go over a small sink in my master bath, but am having a hard time finding one with the right sizes. Thank you so much Judith! I am thinking along those same lines...that I've got to have the other pieces of the puzzle in place before I can decide on a color for the mirror...the vanity has become the most difficult decision because of the size...it is a really narrow space. in my book bold is always better! I think so also…that’s why I wanted something oversized in the mirror department! And yes ma’am they are! I couldn’t life that thing to hang on the wall for anything…LOL Thank you so much for the lovely card…that was so very sweet of you! I hope you had a fabulous weekend! Love and hugs!!! Benita that mirror was worth a 10 hour drive, it is so beautiful! I think you might be able to score something vintage to make into a vanity...you do have some time to find one. I would have to see the vanity/counter top and the wall color in order to pick the color for the mirror. 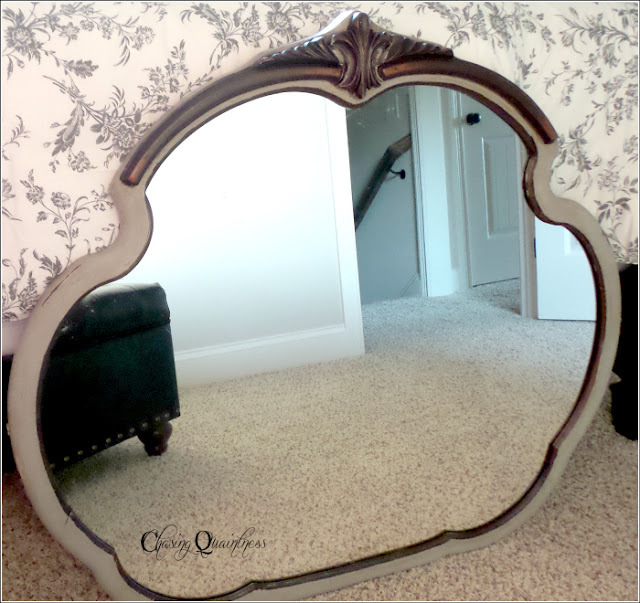 You can paint the mirror last too once you get the other things in place. It will all fall into place and it will be beautiful! Thank you so much Kimberley....I thought it was worth it also. It is plain with just a hint of being ornate. I've been looking for a vintage piece to turn into a vanity, but so far haven't had any luck. I need such a narrow piece, I don't know if I will be able to find anything sturdy enough to hold a sink and faucet. And I've decided that I definitely need the vanity and the wall color before I can pick a color for this mirror...so many decisions and so little time...LOL.. You are too funny! Hugs!! Oh girl..you better have this mirror attached really well to the wall because I'm coming down to get it! LOL…..I think if I told the hubster, he would hang it ever so loosely so that it could be taken away. You should have seen the look on his face when I walked in with it…LOL Hugs!! Thank you so much and thank you for the gilding suggestion....I haven't decided on a vanity or a wall color either, so that's most of my hang up with the colors for everything...gilding....hmmm, that is interesting. Thank you again so much! Hugs!! I'm boring too, go with white :). Or...gild it gold...Or, maybe silver! Or...bronze. Yeah, that's the ticket. Bronze :). There, wasn't that super helpful??! LOL....you are so funny! The gilding had definitely not popped into my head...I think once I get a vanity and wall color, the mirror will be easy, but I do like the gilding idea! What stunning lines this mirror has-I too would go with white or gilding, but I suppose that will depend on what other happenings are going on in the bath. It will be gorgeous for certain! Happy Hugs to such a sweet friend! Thank you so much Jemma. I loved this mirror as soon as I saw it and knew that it would be perfect for this bathroom. It is so very large, but will make a great statement. I’m really liking the gilding idea…I hadn’t thought of it, but am turning it over and hope to find some tutorials on how to do it! Hope your week is off to a great start! Love and hugs to you!! I'm with you on the mirror. It's lovely and cheerful. Who would not be happy looking in that mirror? Great mirror - I know you can work your magic on the bath. Or buy more mirrors and cover the walls. That mirror is beautiful...You sound like me with the ORC...I have to slow down to keep up with everyone or else I would already be finished. I cannot wait to see what you do. What graceful lines the mirror has! Can't wait to see how it looks when you've finished the job. We've only bought one thing off Craigslist, years ago. I need a rug now so should look. One of our sons finds so many unique things that way. 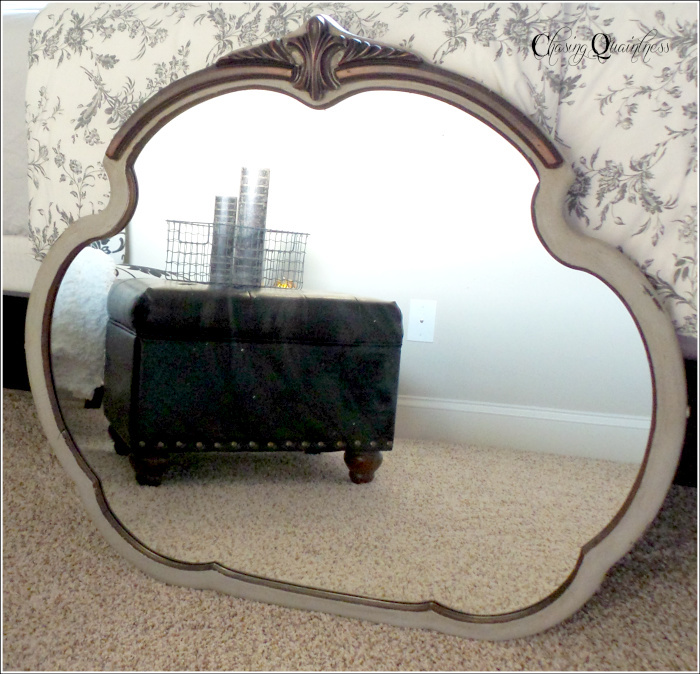 Graceful...what a great choice of words for this mirror and thank you so much!! I think it probably was in a former life and hope it will be again! We've bought and sold a great many things on Craigslist...there are just so many wonderful things available! Love and hugs to you!! You have to love Craigslist for a great bargain!! I bought my china closet on there for $125.....delivered!! Can't wait to see what you do with this mirror. WOW…what an awesome deal!! AND delivered! You can’t beat that at all!! There are so many great treasures on Craigslist…it is a wonderful resource! I’m still tossing around ideas…just need that vanity to pull it together I suppose. It's beautiful!!! Love the shape and intricate top. It's going to look great in the bathroom.